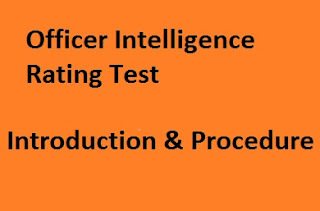 Officer Intelligence Rating or OIR is a test of intelligence of a candidate. 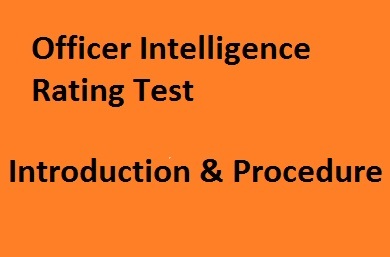 This test comprises of two test booklets, each booklet have around 40 (sometimes 50) questions for which you will be given 17 Minutes time (will increase for 50 questions). You must try to solve all question in the given time. Generally candidates talks unnecessarily about marking scheme of OIR that is if that much questions are correct then OIR 1 or so. But you must avoid any such talk as you can't control these things but you can surely control your performance so focus on that. The Questions in this test are so easy that even a 10th grade student would be too smart to do all of them correctly, but time is the factor which matters the most so match up yourself with time limit. "Watch is not allowed in any test at Service Selection Boards." You must listen to each and every instruction given by the Person who is conducting your test, before actual test starts they will also conduct a practice test to make you familiar with the test. Below, We are providing some Topics with example on which questions are asked in Service Selection Boards but we will be providing only one example for each type of question you must practice more questions to expertise yourself in this test. In this test you will be given few words which you have to arrange in an alphabetical order and tell which letter would come in starting or in last. Q. Arrange the following words in alphabetical order and state the number of the word which will come last. You will be given a word in which the alphabet's position is changed and you have to rearrange the alphabets and find out a meaningful word from that word. Q. Find out a meaning full word from the below given word. You will be shown two cubes, in which you can rotate the cubes in your mind and find weather two cubes are similar or not, If the cubes are similar then write YES in your answer sheet else NO. Q. Find weather two cubes are similar or not?. Write Yes in your answer sheet if they are similar and write No it they are not similar. In this type of questions you will be given two Group of cubes A and B both will be having a pattern and from the answer you have to find which cube belongs to Group A. Group B is given to help you to find the cube. Q. Which one of the following cubes which are given below can possibly belong to Group A ? A sentence will be given to you with an underlined word and among the given choices you have to select that option which can best possibly replace the underline word, it is similar to synonyms. Q. From the four options which one can replaces the underline word without changing the meaning of the sentence. The Doctor Assisted the patient to recover from his illness. In this type of question's you will be given a statement which is in form of a fact/opinion and you have to judge weather this statement is True, False or Absurd. You will be given a Statement followed by four options and you have to decide which option best suits the given statement. 1. It does not allows students to copy during exam. 2. Students can't use books during their examination. 3. It has some internal defects and the examination does not reflected the true potential of the students. 4. Good looking students don't gets any preference. Q. How many 6's are there in the following sequence which are followed by 3 and preceded by 8? No Comment to " OIR Test in SSB Interview: Day 1 "